Tina L. Butera, M.D. is Loudoun County’s first full time Pediatric Ophthalmologist. Dr. Butera received her Medical Degree from Medical College of Ohio and completed her Ophthalmology training at The George Washington University. She then performed a Pediatric Ophthalmology Fellowship at Denver Children’s Hospital. Dr. Butera is board certified by the American Board of Ophthalmology and certified by the American Association for Pediatric Ophthalmology and Strabismus. 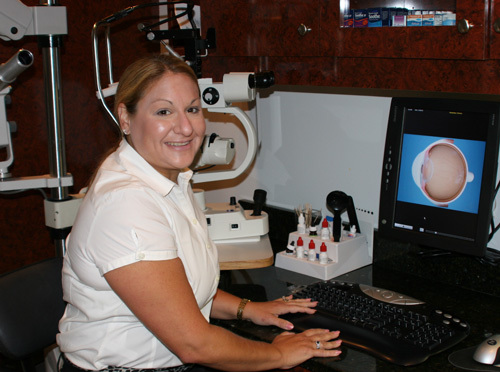 Dr. Butera has over ten years practice experience in all aspects of children’s eye problems including strabismus (“crossed eye”), amblyopia (“lazy eye”), prematurity, and developmental problems. She is accepting new patients daily at our Sterling, Lansdowne, and Manassas offices. Dr. Butera lives in Leesburg with her Belgian sheepdog Storm.